All Cult items listed below are authentic and very limited. We do not carry multiple items. All prices and availability are subject to change. All prices include shipping and handling for all USA customers. All other destinations will require actual shipping cost to complete transaction. Have a question? Ask us before purchasing the item. Thank You. 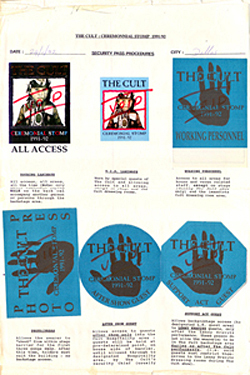 Description: 1987 The Cult Electric Tour guest Pass. Intact pass used at the Dallas Texas show. 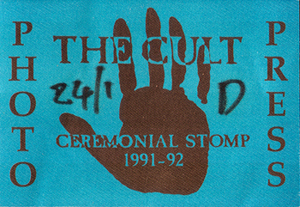 Description: 1991-92 The Cult Ceremonial Stomp Tour Photo Pass. Intact pass used at the Dallas Texas show. 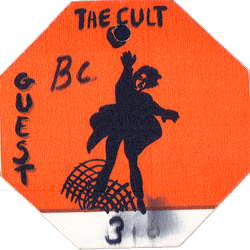 Description: 1995 The Cult 1995 Tour Guest Pass. Intact pass used at the Dallas Texas show. 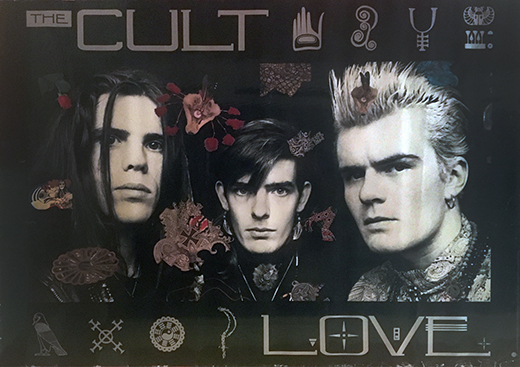 Description: 1999 The Cult Reunion Tour Photo Pass. Intact pass used at the Dallas Texas show. 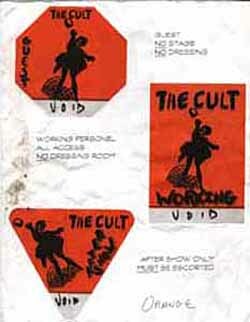 Description: 1995 The Cult 1995 Tour Backstage Pass Identifier. 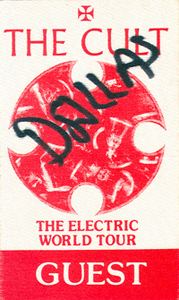 Three peeled Backstage passes on a 8x11 sheet of paper used at the Dallas Texas show. 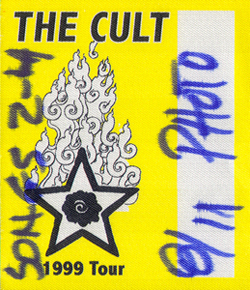 Description: 1999 The Cult Ceremonial Stomp Tour Photo Pass Identifier. Six peeled Backstage passes on a 8x11 sheet of paper used at the Dallas Texas show. 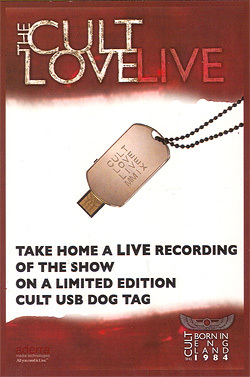 Description: The Cult Billy Duffy Concert Tour Guitar Pick with Raised Iron Cross. 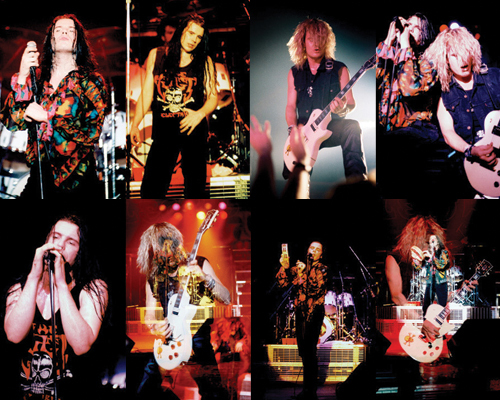 Description: 5x7 The Cult | Guns N' Roses 1987 concert handbill. 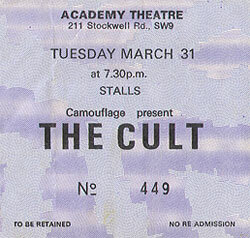 Description: 3x9 The Cult 1995 concert handbill. 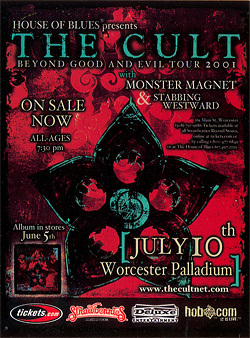 Description: 4x5 full color The Cult 2009 concert flyer. 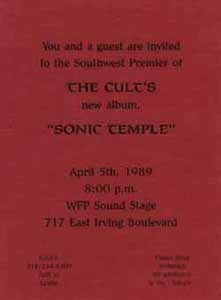 Description: 4x5 full color The Cult 1995 concert handbill. 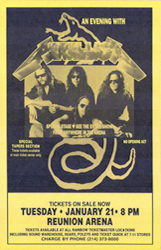 Description: 5x7 The Cult | Metallica 1992 double sided concert handbill. 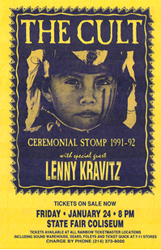 This handbill is for two separate concerts on one handbill. Description: The Cult 1989 CD Release Party Invitation. Exclusive party invite on heavy card stock. Original item. 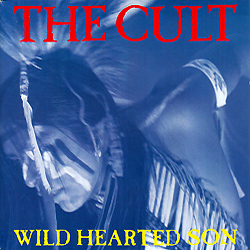 Description: The Cult Wild Hearted Son UK 45 rpm. Item in mint condition. 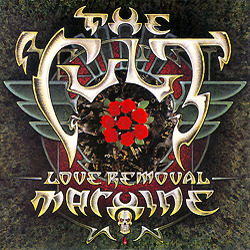 Description: The Cult Love Removal Machine UK 45 rpm. Item in mint condition. Description: Sounds Showcase UK EP 45 rpm. 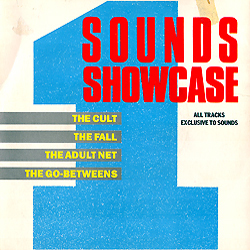 Featuring The Cult, The Call, The Adult Net and The Go-Betweens. Item in VG+ condition. 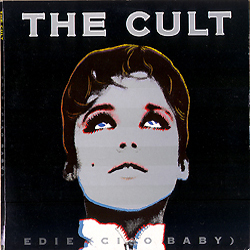 Description: The Cult Edie (Ciao Baby) UK 45 rpm. Item in mint condition. 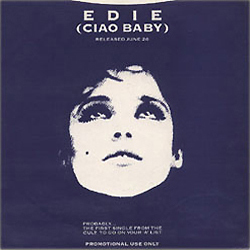 Description: The Cult Edie (Ciao Baby) UK promo 45 rpm. Item in mint condition. Description: The Cult Lil' Devil UK 45 rpm. Item in mint condition. 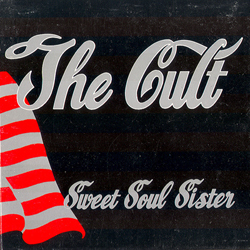 Description: The Cult Sweet Soul Sister CD Single Gatefold. Item in VG+ condition. 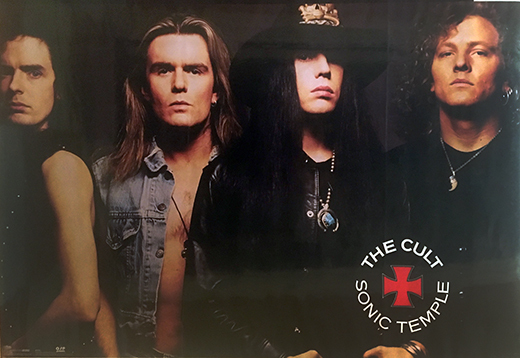 Description: The Cult 1990 Sonic Temple Retail Poster. Size 24x34. Item in mint condition. Description: Full Unused Ticket in mint condition. Opening acts Bonham, Tora Tora.